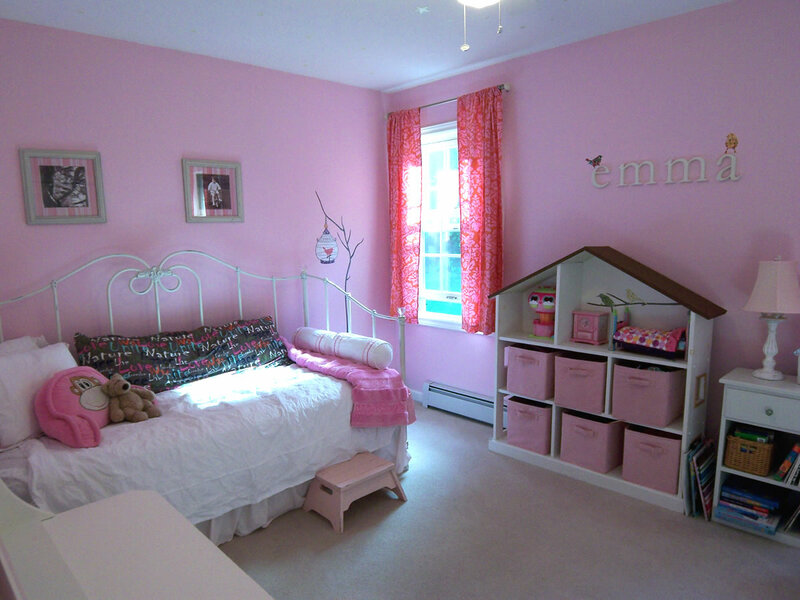 A Non-Princess Pink Room | Your home, only better. 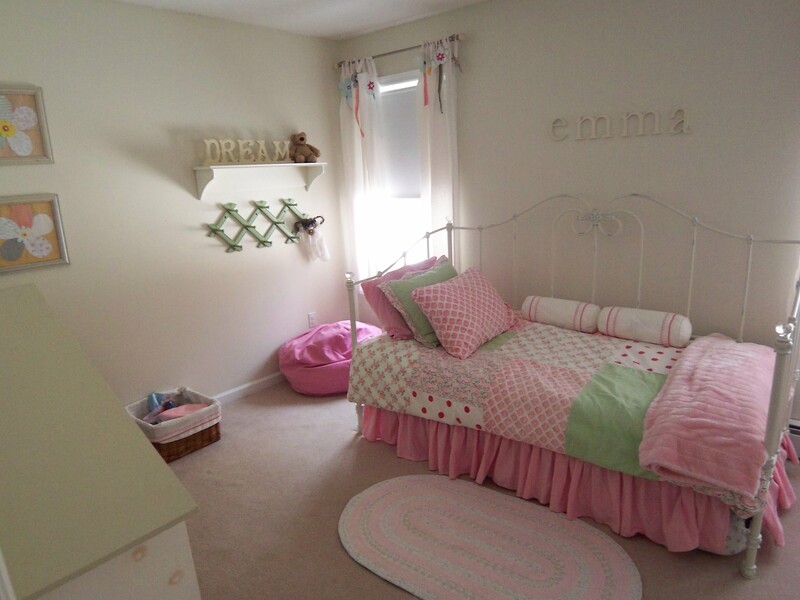 Most little girls will want a pink bedroom at some point in their early lives. 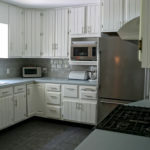 Here’s a redesign project where a four year old girl reached a compromise with mom. A pink room, but without any princess influence. Doable? Absolutely. For under $200? You bet. The strategy was to let pink be pink, but anchor it with earthier brown, and use accessories to bring in a subtle bohemian bird theme. 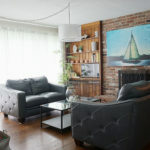 By displaying sepia toned photos on acid-free paper in the existing frames in the room, we created personalized art at no cost! So if you’ve been keeping track, that’s $156 plus one day of labor. Not bad! I love the room! Great room in shades of pink without all the fro-fro-frills. Hi Becky, Those baskets are actually inexpensive cloth bins from Target. I like keeping toy clutter hidden. Thanks for your kind words! It’s my favorite room in the house right now! I love it! 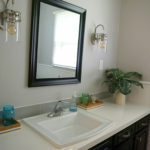 I am curious if you painted the baskets … are those cloth? … on the bookshelves. The whole room looks more fluid with the changes. My eye just wants to sweep through the whole thing and take it all in. It’s great!! 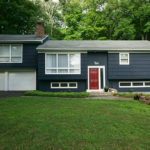 .-= becky´s last blog ..Whew! It’s Friday Again … =-. I honestly don’t remember. I think they actually came from another country – the instructions were in Korean, I think! Just do some searching and see what you find. I bought it as a set, but broke it up throughout the room. .-= Susan´s last blog ..coffee clutch | Web 1.0 – before social media =-. 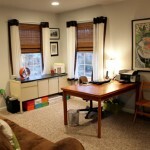 I love the room! I’m actually in the process of redoing our girls’ room. They are both in love w/ pink so I’m trying to find a balance also. It’s nice to see someone else poll it off. If you don’t mind sharing your source, who did you buy the decals from on ebay? I was looking for some bird decals for our bathroom and those look perfect. .-= Mrs. Not the Jet Set´s last blog ..Fresh Eats =-. Aren’t those birds fun? 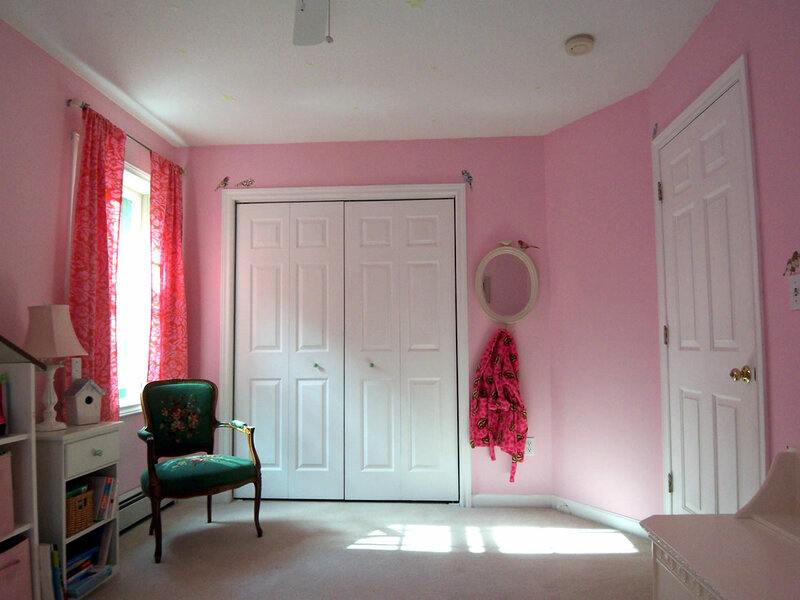 There are actually 10 birds hidden throughout the room. She named them all! I love that the birds are appearing throughout the room now. The 2 perched on the ‘Emma’ letters are a great idea! Great room in shades of pink without all the fro-fro-frills. Thanks for sharing the inspiration. LOVE your makeover. 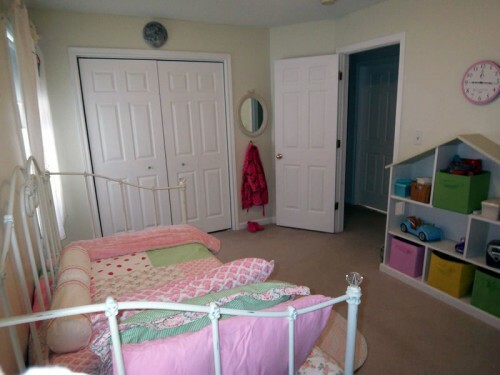 It is such a challenge to find non-princess pink loveliness for a girls bedroom – I made over my 2 daughters’ rooms recently and took a lot of searching to avoid the princess look. Oh, it’s very pretty. That’s the beauty of pink, you can create so many different moods by adding different colors. 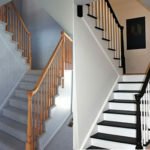 I’ve always been partial to pink and charcoal grey but it’s a difficult scheme to carry off, not for the lighthearted. WoW! 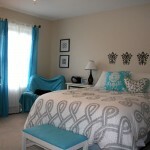 what a gorgeous girly room… & the cost is not really reasonable. Wonderful girl’s room. I never thought too that the colours can be nice mixtures. That´s so pretty. I had never thought of the way brown tones down pink before and it really works! I love it, before and after! My three year old would love this PINK room. Beautiful Redesign. Ha ha ha – tomatoe, tomahto, right? Love it. Around my house, the girls thought they could get away with it by calling it “Peach.” None were pink nuts though. 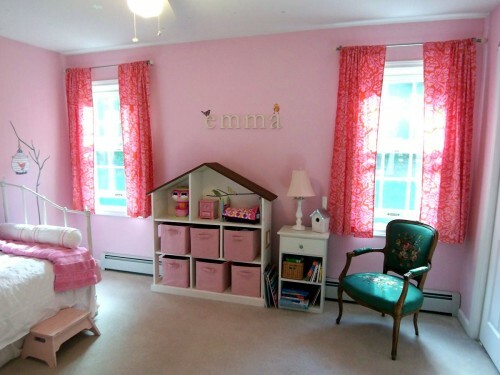 That is an ADORABLE PINK bedroom… makes me wish for a SECOND that I had a girl! My daughter has been in a pink-fanatic phase pretty much since she was born, so she’d love this room! It’s so sweet. I really like the way you used the bird and branch decals. Looks great! I would find something similar about each of them. Either the same size, frame color, matting, or perhaps all black/white and arrange them first on the floor, then to the wall. To keep them in the right position, us a little putty tack at the base of each frame. Or, how about a nice digital frame that scrolls through the pictures? My mother has a lot of family pictures of all sizes, how can I help her with a good layout. She wants to exibit them not scrapbooking. Please help me with that. 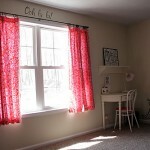 pink, little girl room, BUT you kept it simple. I live it. This looks great! I love it! Of course, I’m a pink fiend myself (minus the princess paraphenalia too). Did you see the girl’s bedroom I posted on my blog on bedding? Great job Susan!